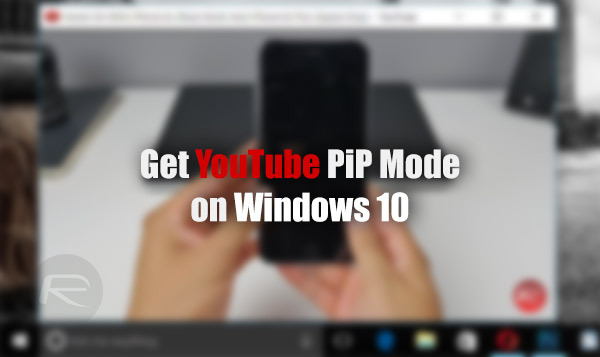 Here’s how to get picture-in-picture mode in Windows 10 for YouTube (and some other videos) running inside Chrome web browser. Picture-in-Picture mode has become a really useful feature across all forms of computers and mobile devices lately, as it basically allows apps to be pinned in a smaller window over the top of all other running apps, which of course is extremely beneficial for those using the likes of YouTube to view videos whilst working on other things. As it stands, the public release of Windows 10 doesn’t currently offer a Picture-in-Picture mode natively. However, those who keep abreast of new features in their favorite platform, or those who have access to the initial developer preview builds, will already know that Microsoft plans on rolling out a feature called Compact Overlay window, a fancy internal way of saying Windows 10 is getting Picture-in-Picture mode very soon. 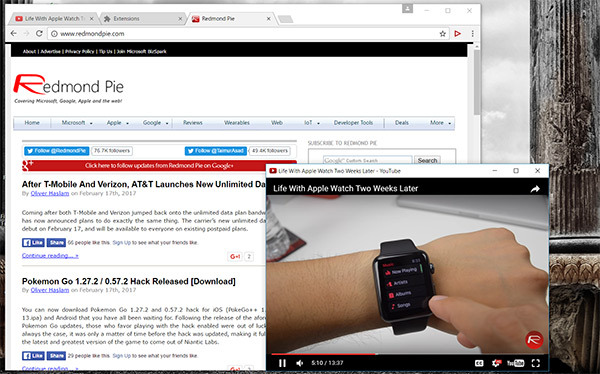 However, if you are a Windows 10 user, and you can’t wait for official implementation to arrive, then allow this YouTube Picture in Picture Google Chrome extension be your pinned-video savior. 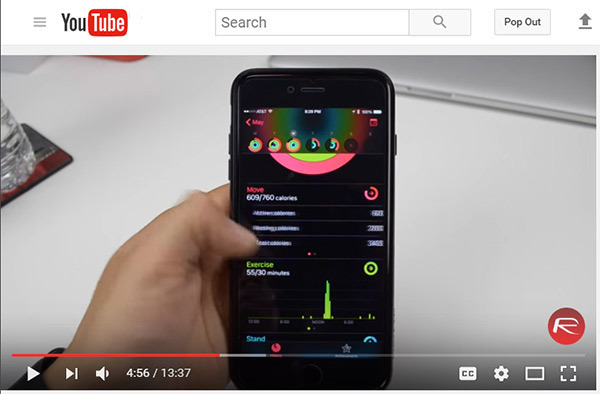 If you’ve ever used Google’s modern YouTube app on iOS or Android, then you will know that you can simply swipe down on the playing video and have it float around in the YouTube app. The YouTube Picture-in-Picture extension for Google Chrome basically attempts to replicate that functionality, but it does that with minimal fuss and the integration of a simple button. When installed, and running a video on YouTube inside Chrome, you will see a button right next to the search field, “Pop Out”. When tapped, it will instantly put the playing video in its own little overlaid and pinned box. The pinned window packs all the playback controls, including Quality Settings. There’s also the option to instantly return the playing video back to its original size in its original frame, as well as choose between large and small sizes for the pinned video. Developers behind it have also added a right-click option which adds the “Picture-in-Picture” menu to instantly turn the video into a pinned window on the bottom right-hand portion of the display. But that’s not all, in our testing, we have also found it working on some other popular video sites other than YouTube such as Vimeo and official Planet of the Apps site. 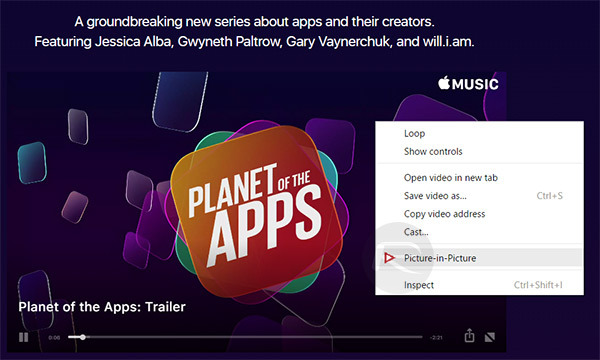 Simply right-clicking and selecting “Picture-in-Picture” on compatible video will do the trick. 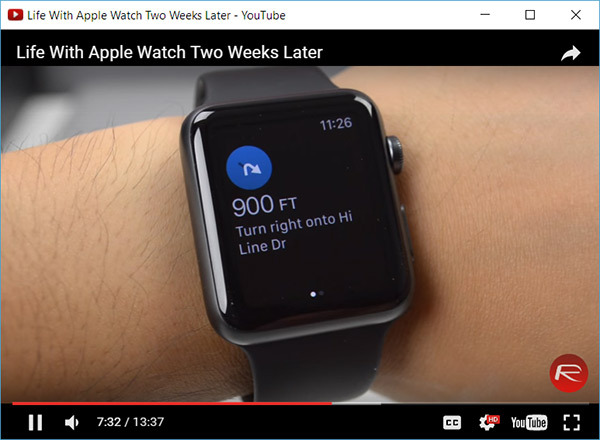 So while the official Compact Overlay implementation by Microsoft is on the horizon, but if you are a Windows 10 user and don’t mind using Chrome as your default browser of choice, then this YouTube Picture in Picture extension should do the job for you right now. But it just put it in another browser window popup, and that window isn’t even always on top?